There are so many places I have not gotten a chance to share with you. I’m sure if you are keeping up with my social media platforms you have seen pictures of me here, there and what seems to be everywhere. Instead of making a few blog posts, I have decided to do a round up. Not trying to flood anyone’s inbox. So where do I start on this round-up? Agave. I have driven past this restaurant for way too many years. Always saying one day I will try it out. Well that one day finally happened. And boy was I more than happy with that choice! Agave is self described as “an eclectic southwestern eatery and tequila bar” located in the Cabbagetown area of Atlanta. Taken straight from what it says on their website. Let me tell what Agave is to me. It is Honey, Cider, Smoked Bacon Collard Greens that makes you wish the chef was your Abuela, even though it’s a guy. It is Southwestern Mac & Cheese that will have you thinking that the Western part of the United States could hangout with you in rural Georgia and not be condemned for being a different kind of mac & cheese. The Barbacoa & Chorizo Chile Taco makes you want to write a letter to Taco Bell and ask them why not strive harder. The Stuffed Mountain Trout Tomatillo makes you want to grab your fishing pole, go fishing in the Georgia mountains, and grow your own tomatillos. What I had that night made me rave to every person I came in contact with. I just want to go back again and again. Taste of Atlanta. I have always wanted to attend food festivals but never have. Go figure. Taste of Atlanta is just what it sounds like. It’s a chance to sample (via purchased tickets) dishes from some really great restaurants from the metro Atlanta area. There are also chances to meet and taste samples from large food companies like Goya and Smithfield. There were even demos and cooking classes by some of the best chefs in the city. 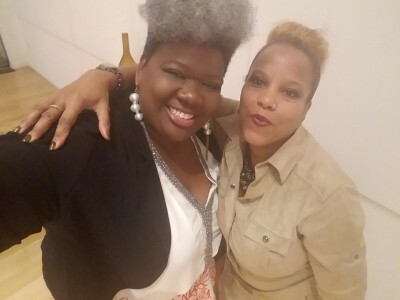 My two favorite things from this event was getting to meet, talk with and take a picture with one of my new favorite chefs in Atlanta: Chef Richards of Richards Southern Fried. The other one was getting to taste Revolution Gelato. Why was that such a big deal for me? Well this was non-dairy ice cream made from coconut milk and cashews. Had I been blindfolded I would not have been able to tell the difference. It was so good I had to rejoin the line for a second go round. Twelve Eighty. This restaurant is adjacent to The Woodruff Arts Center and across from The High Museum. It is quite a good spot to be for those of us that like to spend the afternoon strolling among the art or taking in a play. The atmosphere pulls you in but the food makes you want to come back again. My bloggers group was invited to the restaurant’s Fall menu tasting. I mean who doesn’t like a chance to sample food and spirits. I was there with bells on. Since I had a plus one I invited my friend, Kenya Freeman, now of Project Runway fame. It was such fun for us to hangout a little, since we both have busy schedules. They offered everything from apps to salads to sandwiches and unforgettable entrees. There is something for everyone. The staff is memorable. We got to meet and interact with the general manager, the maitre’d, executive chef, pastry chef and the wonderful waitstaff. You couldn’t ask for more. Please check out Twelve Eighty the next time you find yourself in midtown Atlanta, whether you ar taking in the art scene or not. C.I.P. and Kenya Freeman of Sylvia Mollie and Project Runway fame…so proud of her. There are a few more places I have been honored to visit in the last month or so. However, they require more room to share than in a round-up. As always I made some great memories. Now go forward and make some new memories of your own.